I'm back with another outfit post! It's being so long since I posted lots of different outfits on my blog. The reason being, I felt like my outfit photos looked unprofessional and I tried finding a new place to take them and getting super frustrated in the process but unfortunately this is the best I can do for now. I am working on learning my camera more and I now own a soft box so hopefully I can come up with something different for you soon. Anyway onto the outfit now. It consists of two pieces, both from Nasty Gal. A gorgeous maxi/midi? floral dress and some beautiful white leather boots. The dress is this gorgeous black and pink floral print with a big ruffle for the hem. It features a wrap style neckline with a belt tie to keep it together and nipped in at the waist plus it also has long sleeves. 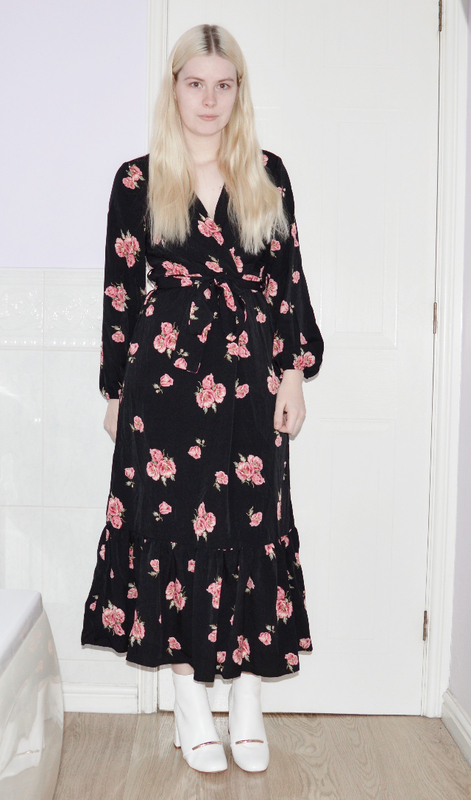 I wasn't sure whether to call it a midi or a maxi dress as I'm quite short (5'4') and maxi dresses usually drag on the floor for me but this sits quite high above my ankles. Of course for the model in the product photo it sits even higher up. I think this item works well for both winter and summer as in winter you can pair it with a nice jacket/coat and wear thick tights underneath for an added warmth. While in summer it can be worn on it's own and will also keep the chill of the British summer at bay. I also showed a close up of the boots over on my Instagram. Let me know what you think to this outfit in the comments below. Leave a link to your blog too and I'll be sure to check it out! Items marked with a * I received free of charge. All opinions are my own.